Send a gift via email to your special chef. They'll receive it in less than 24 hours. - To guarantee the arrival of your electronic gift certificate on any specific day, (weekends and holidays included) please order by 4:00pm PT the previous day. 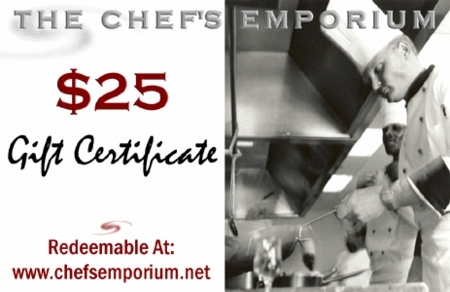 To redeem a Chef�s Emporium Electronic Gift Certificate, simply enter the Gift Certificate number upon check out (prompted in step number 2). Coupons and gift certificates can not be combined in the same order. Multiple gift certificates can be redeemed in one order.